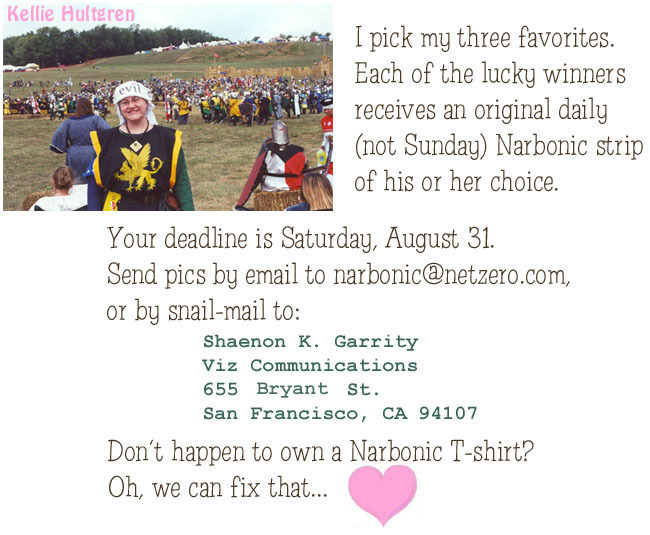 Yes, I used to use Viz for all Narbonic-related correspondence. I thought it would be safer than giving out my home address. Do not use this address. It’s a car dealership now. Man, I can’t believe I’ve gotten so far into the archives that I’m up to the second T-shirt contest. It doesn’t feel like I’ve been writing commentary for that long. 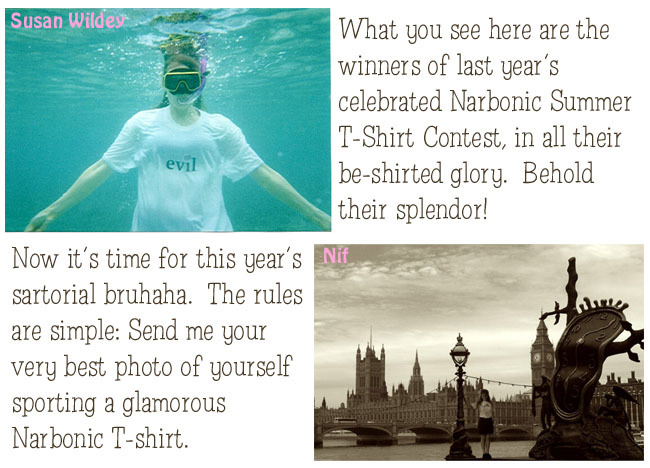 Anyway, like I said last year, I did the T-shirt contests until I stopped selling Narbonic T-shirts. Later they were replaced with gerbil photo contests, because the gerbils sold (and sell) better than the shirts. Hard-To-Believe Fact: When you started this Narbonic commentary thing, the word “lolcat” did not exist. When I started this Narbonic commentary thing, Earth’s landmass formed a single continent known today as Pangea. Fact: My picture in the “Spot the Non-Dave” strip is now exactly half as old as my driver’s licence picture. Once again explaining your telling depiction of Earth in the Victorian serials! Ah, it is a good feeling to laugh as hard as I didat that line– I have heard a lot of “I have been doing X so long that Y” statements over time, but that one is just grand.